Educators and researchers around the world now have free access to a database of whole slide images (also known as virtual slides) for histology and pathology. Featuring thousands of virtual slides contributed by 15 universities, The Virtual Microscopy Database, VMD, (http://www.virtualmicroscopydatabase.org/) is an online resource that allows educators to view and download virtual images and share their own. Powered by MBF Bioscience‘s Biolucida® for Medical Education solution, VMD gives educators an overview of individual slides and allows examination of various parts of the image at magnifications up to 40x. The users can take a screenshot or download the file at any time. Funded by an Innovations Program Grant awarded by the American Association of Anatomists (AAA), the resource was developed by researchers from the University of Colorado, Drexel University College of Medicine, and the University of Michigan with corporate support from MBF Bioscience. With thousands of freely accessible virtual microscopy images, the VMD helps meet a growing need for better access to histology slides among educators and non-profit research organizations. The AAA foresees the images being used in a variety of educational ways such as for lectures, exams, and for creating supplementary course material as well as for non-profit research initiatives. “We are proud to be part of the AAA’s efforts to improve the access of histology and pathology digital slides for medical educators and students by providing the underlying technology for this important resource. Any of the virtual slides in this new resource can be downloaded and used on an organization’s Biolucida on-premise or cloud-based server,” says Jack Glaser, president of MBF Bioscience. Individuals affiliated with educational or research institutions may register to access the database. 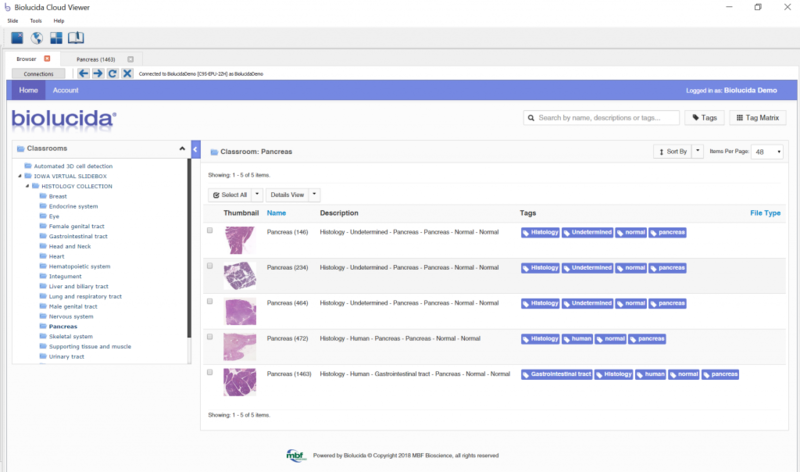 Once approved, users can browse files, or search for specific types of tissue. Currently, the VMD site includes over 2,600 virtual microscopy files, but as new users join the VMD file sharing community that number will grow as will the diversity of tissue and species type. The American Association of Anatomists was founded by Joseph Leidy in Washington, D.C. in 1888 for the “advancement of anatomical science.” Today, via research, education, and professional development activities, AAA serves as the professional home for an international community of biomedical researchers and educators focusing on the structural foundation of health and disease. MBF Bioscience produces advanced microscopy imaging and analysis systems for biomedical research and education. The award-winning company was co-founded in 1988 by Edmund and Jack Glaser. Posted in MBF Company News and tagged biolucida, Microscopy, press release, Virtual Slides.